Mold: those damp, fuzzy looking spots that you occasionally find on a piece of bread or some old leftovers in the fridge. Mold likes more than just food, however. If there is moisture, mold can begin growing anywhere—up walls, in carpet, even on the ceiling. It’s as if mold is always waiting for that one opportunity to ruin your home. You can see it grow up your walls, or it can hide behind drywall, in attics, or under carpets. Mold damages the material it lives on, impairing structural integrity and creating a dangerous environment. Not only can mold ruin your home, it can ruin your health. Maybe, you haven’t even seen mold growing anywhere. Then suddenly you are wheezing, persistently coughing, and showing signs of an allergic reaction. Don’t ignore these signs! They are common symptoms of mold and it is due to the fact that mold is ruining the air quality. Mold creates tiny little spores that fly into the air that you inevitably breathe in, sticking to your lungs and causing respiratory issues. 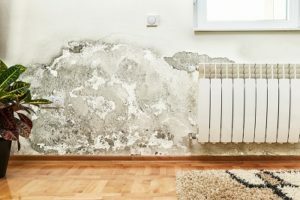 Once mold is inside your home or business, it is important to work with the right company that’s certified in mold damage repair and restoration. That’s Big Red’s Guaranteed Clean. We are skilled in advanced microbial remediation (mold removal) as well as experience in handling insurance claims. We can be your trusted mold cleanup and repair providers for emergency situations and that include water, fire, and smoke damage. Dealing with situations like these can be overwhelming, but we promise to take can of the situation quickly, affordably, and professionally, so that you can return to your home or business damage free. Contact us at the first sign of mold and we guarantee to remove and restore your home in no time.